Figure skater Weir's favorite city has always been New York City. When he was a young lad, Johnny Weir wanted to jump on horses, not on ice. Since his father was raised on a horse farm, it was only natural that Johnny would learn to ride. An accomplished rider by the age of nine, Weir competed in a variety of equestrian events with his pony, My Blue Shadow, a dappled gray Arabian-Shetland cross. He won lots of ribbons and even competed in the Devon Horse Show. But then a couple of events conspired to change his life. First came the explosion of televised figure skating after the 1994 Olympics. As his mother was watching the skating, it caught Weir’s interest, so he thought he’d try out some of the jumps himself in his basement on roller skates. That gave his parents an idea for Christmas. Although no one in is his family was a skater, they got him some skates and group skating lessons for a Christmas present. He immediately went outside to try them out on a frozen field. After his first lesson at the University of Delaware, Weir decided to try jumping. And he proved to be a natural at it. “I got an Axel after one week of those lessons,” Weir related, “so I had to quit equestrian for skating.” There wasn’t enough time to both ride and skate. By that time, he was twelve, two or three times as old as most elite skaters are when they begin their training. But that didn’t prove to be an obstacle for Weir. Within a few months, Weir was working under the tutelage of Priscilla Hill, 1998 Professional Skaters Association developmental coach of the year. He quickly learned all of the single and double jumps and before he was 13, he had landed his first triple, a salchow. It took him two weeks to learn a double Axel, a month to learn a triple flip. “My favorite jump is the triple lutz,” he said. “All my jumps are pretty good but my best is the triple lutz.” For next season, he expects to learn a quad, preferably a quad lutz, as well as a three triple combination, either Axel/toe/loop or lutz/toe/loop. He also likes to spin and includes spins in his programs that he’s learned from watching Lucinda Ruh. “My favorite spin is the Lucinda spin,” he said, referring to the pancake spin, which he includes in his program. Weir plans to have his own unique spin designed by his spin coach, Bobbi Shires. During his first year in skating, Weir qualified for the Junior Olympics in juvenile freestyle, finishing fourth. He also qualified in pairs with Jodi Rudden, with whom he also competed in intermediate pairs the next year. But he decided to concentrate on freestyle because that’s where he could jump the most. He won South Atlantics and Easterns, then took the bronze at the 1998 U. S. Nationals in novice men, then moved up to juniors. 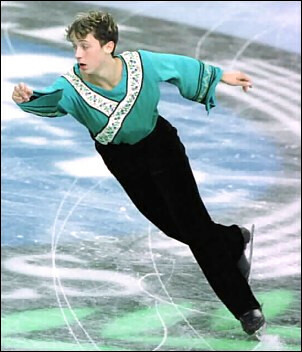 That resulted in wins at the North American Challenge Skate and the Grand Prize SNP in Slovakia, After winning Easterns in 1999 and 2000 in junior men’s, he finished fourth and fifth at Nationals. At the 2001 U. S. Nationals, Weir moved to seniors, where he finished sixth. Still only 16, Weir continued to compete on the international circuit as a junior. He won the 2001 World Junior Figure Skating Championships in Bulgaria in March. He landed eight triple jumps in the qualifier, including both a triple lutz-triple toe and a triple Axel-triple toe combination, which he also used while winning the short program. Although he had to downgrade to a triple Axel-double toe in the long, the program was still good enough to win. “I didn’t think I was going to win. I thought Restencourt would win,” said Weir, referring to the Frenchman who had won silver the previous two years. Weir hopes to use this latest win as a springboard to a national, world and Olympic championship as other skaters have done. Two of the main contenders for the 2001 Worlds and 2002 Olympics are his role models, Evgeni Plushenko and Tim Goebel. “They are both great jumpers and young and have both made names for themselves which is what I want to do,” Weir noted. Hill noted that the competition “was a great learning experience for him to compete against the top skaters. It will definitely help in the Grand Prix later in the season. Weir noted that he was very nervous for both programs, especially after drawing to skate last in the short. “I realized that I can only control me, nobody else, and it really helped me. I skated really well for me in the early season. Not everything was crisp and neat the way I like it, but I got through it. I came out tenth and didn’t get last which I was worried about. Weir has had a busy season, finishing eleventh at Skate Canada and fourth at Trophee Lalique, even though he was suffering from a stress fracture in his leg caused by too many quad attempts. Weir missed Easterns as a result of the injury but has resumed practicing on a limited basis, with no quad attempts. Not being able to practice the quads has depressed Weir somewhat since jumping is his favorite aspect of skating. But he noted that “I’m really starting to enjoy choreography. I’m happy with my jumping but I still have to work on the in-between stuff.” Hill noted that sometimes he works on it too much by changing his program when he’s competing. Yuri Sergeyev choreographed both of Weir’s programs for this season. He is using “The Umbrellas of Cherbourg” for the technical and a combination of “The Puppet Master”, “Spirit of the Peacock”, and “City of Sadness” for the free skate. “I really like ethnic or violin music,” Weir said. “I normally go searching for my own music. You can’t skate to something for a year and not like it so I always pick my own music. Of course I have to have everyone’s “okay” on that first.” Off ice, Weir likes pop music His favorite singers are Ricky Martin, Christina Aguilera and *NSYNC. But Weir’s favorite city has always been New York City. From the first time he went there, Weir decided that was where he wanted to live someday. He likes the hustle and bustle, the shopping, the restaurants, and the shows. He visits a couple of times a year, including an annual birthday trip with his mother and with his former pairs partner, Jodi Rudden, and her mother. Weir returned home from the Goodwill Games early in the morning of September 11, just in time to witness the destruction of the World Trade Center. On a lighter note, Weir remains a typical teenager. He likes to shop, talk online using his computer, and jump on his trampoline. He even updates his own web page at www.figureskatersonline.com/johnnyweir. Johnny has also enjoyed skiing, swimming, and diving when his schedule permitted. When he goes to the movies, he watches comedies, dramas and horror films. Johnny’s family has lots of pets. His pets include two birds named Sunshine and Star and a Chihuahua named Bon Bon. Johnny collects pandas and crystalline dragons.